To help more people find Local Food, and our Marketplace, we have set up an affiliate scheme so other websites, blogs, etc. can link to our pages and earn commission from trade, or add great content and be doing the right thing. 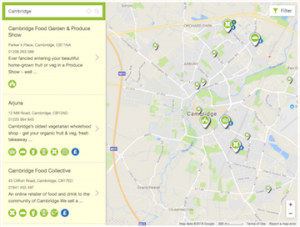 We also offer our BigBarn Local Food Map for your site. This represents great content for any foody, green or simply local interest website and the more trade the better for local food producers and local economies. You can add one of the following banners to your page/s, or have our Local Food Map and MarketPlace open within your site to look as though it is yours.